Location: At the headwaters of the Kowee Creek drainage, southwest of West Juneau on Douglas Island. Dates of Operation: Early 1950's to mid 1970's (up until the Eaglecrest Ski Area began operating in '75/'76) Note: Skiers hiked up and skied down these runs in the 1930's and 1940's before the lift was installed. 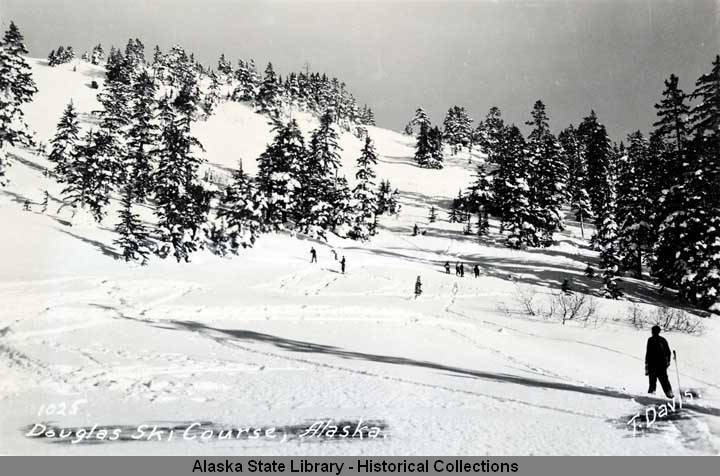 Lifts: The Army rope tow that was bought in Seward and installed at the 2nd Meadows ski area after World war II was moved to this site by the Juneau Ski Club in the early 1950s. 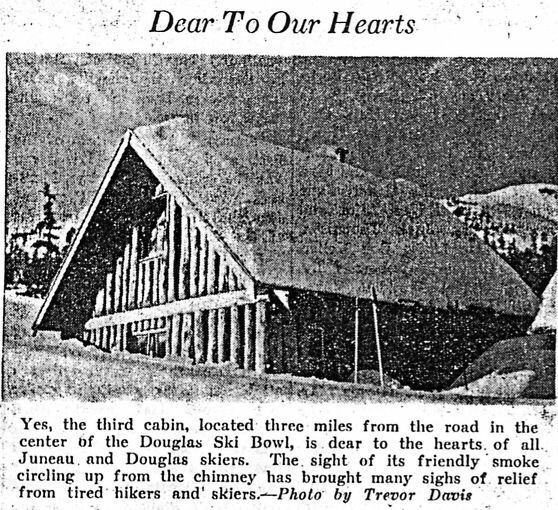 Facilities: The Juneau Ski Club built a warm-up cabin at this site. Originally it was called the "3rd Cabin". 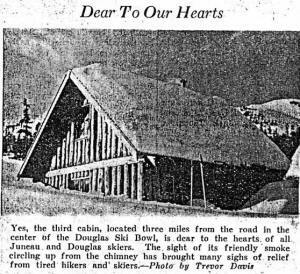 Now it is referred to as the Upper Cabin or the Dan Moller Cabin. 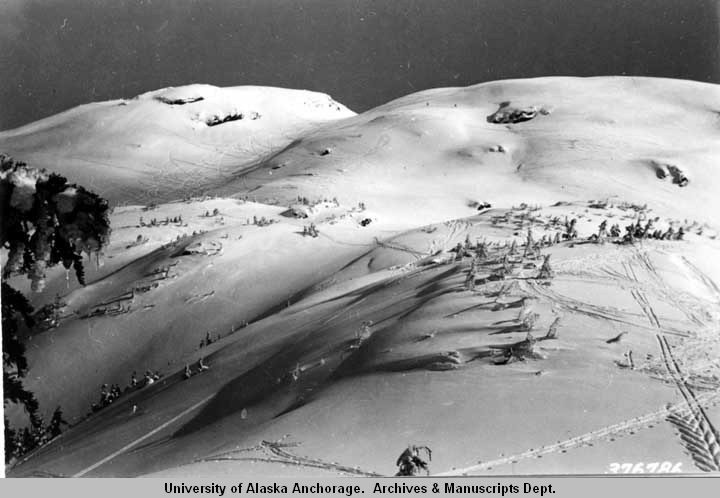 Miscellaneous: Skiers were transported to the Douglas Ski Bowl up the Dan Moller Trail by a Tucker Snowcat, dubbed "Oola, the Juneau Ski Train", that pulled a sled caboose that held 40-50 skiers. 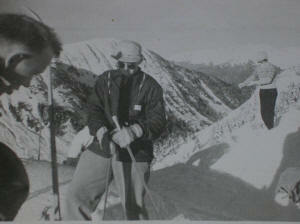 When "Oola" wore out another snowcat operation serviced this ski area, along with a helicopter service. Near the proximity of the cabin, there were approximately 10 km of cross country ski trails. These trails were used in the 1950's and 1960's. 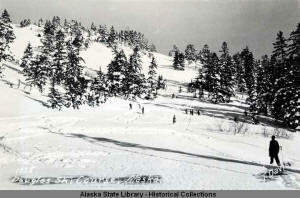 Tracks were mostly skied in prior to 1968. 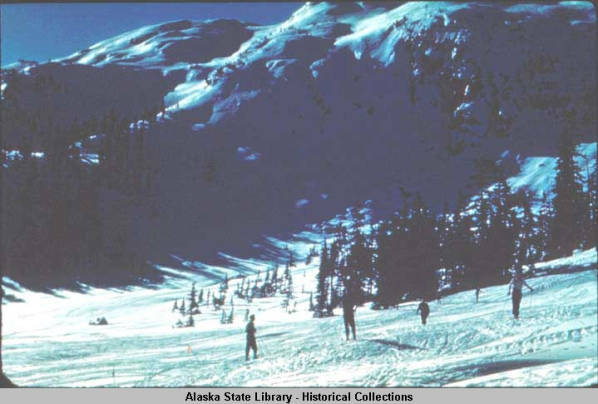 Then Bob Janes purchased the first Ski-do Bombardier snowmachine in the Juneau area and put it to use setting ski tracks in this area. 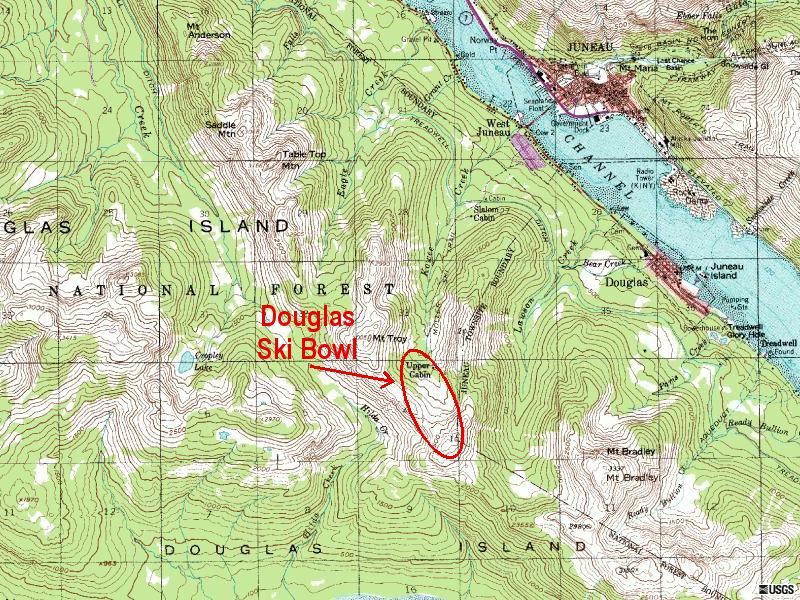 Joe Heersink, a school teacher and coach at they Juneau-Douglas High School also was actively involved in the development of this ski trail system. The third step up the valley occurred in the mid-'50s when the Juneau Ski Club purchased a snow cat modeled on a tracked vehicle used by Adm. Richard Byrd during his exploration of Antarctica. Named the "Oola," Norwegian for "the strong one," the cat cost $10,000. "That was a lot of money in those days," said [Tom] Stewart, who helped raise the funds. As many as 40 people were packed on the back of "the strong one" and pulled up to the bowl area at the end of the valley where a small rope tow carried people to a ridge. "Oola suffered a lot of breakdowns but we kept it going for 10 years," said [Dean] Williams, who then worked for Pan American Airways. "On an excellent day we never had more than 200 people up there." said [Al] Shaw. 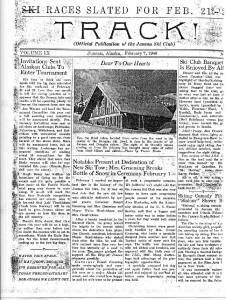 Photos: Does anyone have pictures of the skiing at the Douglas Ski Bowl, or of the Dan Moller Cabin, that they would like to contribute to ALSAP? [left] (1940s) Douglas Ski Bowl, Joe Werner takes flight. "Taken from the ridge near the top of the Douglas Ski Bowl, about 2,600' elevation, looking northeasterly down Kowee Creek and the Dan Moller Ski Trail toward the Mt. Juneau ridge in the background. The Mt. Troy ridge is directly behind the skiers. And I agree that this was probably in the late 1940's or early 50's." 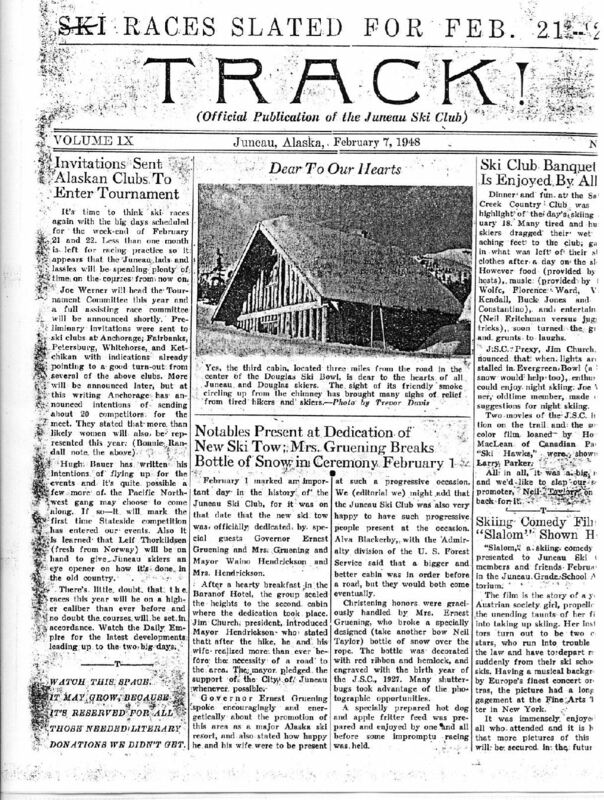 A February 7, 1948 issue of TRACK !, the Official Publication of the Juneau Ski Club, featured a picture of the Dan Moller Cabin (a.k.a 3rd Cabin). 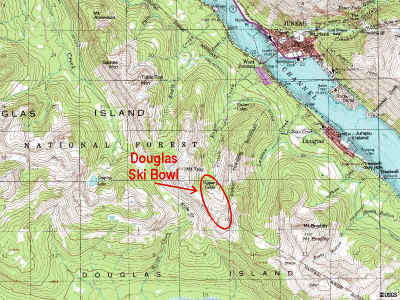 Bob mentioned that there were approximately 10 km of trails in the vicinity of the cabin in the Douglas Bowl during the 1950's and 1960's. Joe Heersink, a teacher and coach at Juneau-Douglas High School was involved in the development of these trails. 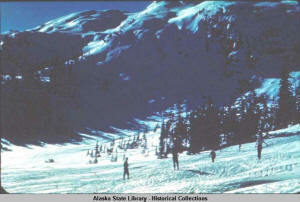 Ski trails initially had skied-in tracks. But in 1968 Bob bought the first Ski-do Bombardier snowmachine in the area and it was used to set ski tracks on these trails. My Mom skied in Juneau in the Douglas Ski Bowl in the 1940's which I call the infancy of skiing in the U.S. She said that she would hike up the hill to get in a few runs. I believe she skied all day though. One time she skied all day and when she came down from the mountain she had a white shock of hair from her bangs that she pulled back - sun damage from the sun and snow combination. 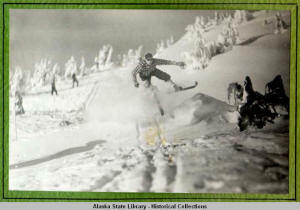 I have a lovely picture of Mom with her skis over her shoulder and she's on some Alaskan Woman's magazine. Very cool. I think it was in the mid '40's but don't remember if the magazine has a date on it. 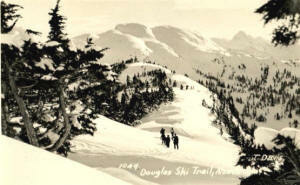 She always spoke very fondly of her years skiing in Douglas. I think she mentioned the upper cabin as the place she hiked to. No cats to pull you up in those days.